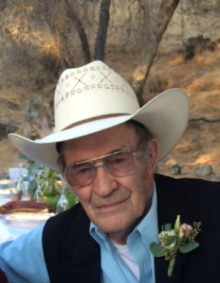 Glenn Crofutt, 86, passed away July 5, 2018 at the Hot Springs County Memorial Hospital inThermopolis, Wyoming following a period of declining health. Born January 27, 1932 in Niobrara County, Wyoming, he was the son of Charles and Edith (Lineback) Crofutt. Glenn’s parents and a sister died in a fire in 1938 leaving Glenn and his remaining seven siblings to be raised by their oldest sister, Mildred. Glenn graduated from Niobrara High School and eventually owned and operated his own ranch. In 1951 he married Shirlee Ann Thompson in Lance Creek, WY. After retiring from ranching the couple lived in Wickenburg, Arizona and Springville, California. They moved to Thermopolis in the early 2000’s. Glenn’s interests included collecting and repairing antique clocks. He had an uncanny ability to fix anything and everything and enjoyed attending local auctions, buying items that others deemed as mere junk – just so he could repair it.. During his time in Arizona, he spent years restoring a rare 1930’s Marmon car, and he and his wife participated twice in The Hemmings Motor News Great Race traveling east to west one year, then north to south the next..
Those cherishing his memory include his wife of 67 years; children, Diane Winter of Thermopolis, Will Crofutt of Miles City, MT, and Cheree Linford of Bakersfield; eight grandchildren; eight great grandchildren; two sisters, Iris and Lola and numerous nieces and nephews. He was preceded in death by his parents, seven siblings and son, Michael. Memorial services are planned for Friday, July 13, 10 am at Pier Funeral Home in Lusk, Wyoming. Interment will follow at Lusk Cemetery.